Every organization needs to have a presence on Facebook. Even if this isn’t the main social media platform for a company, they still must be there. Stevinson Automotive has seven dealerships in the Denver, Colorado area. 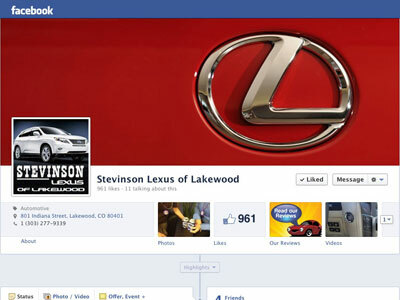 Stevinson Lexus of Lakewood is the most established Lexus dealer in Colorado. We chose a bold use of the Lexus logo from the back of a Lexus sports car to represent their brand. Please contact us (http://greenergrassmedia NULL.com/about-2/) for more examples of social media page designs. Leverage your social presence to connect with more customers. Find out more (http://greenergrassmedia NULL.com/social-media/). Let us make your business look better. Find out more (http://greenergrassmedia NULL.com/design-portfolio/).